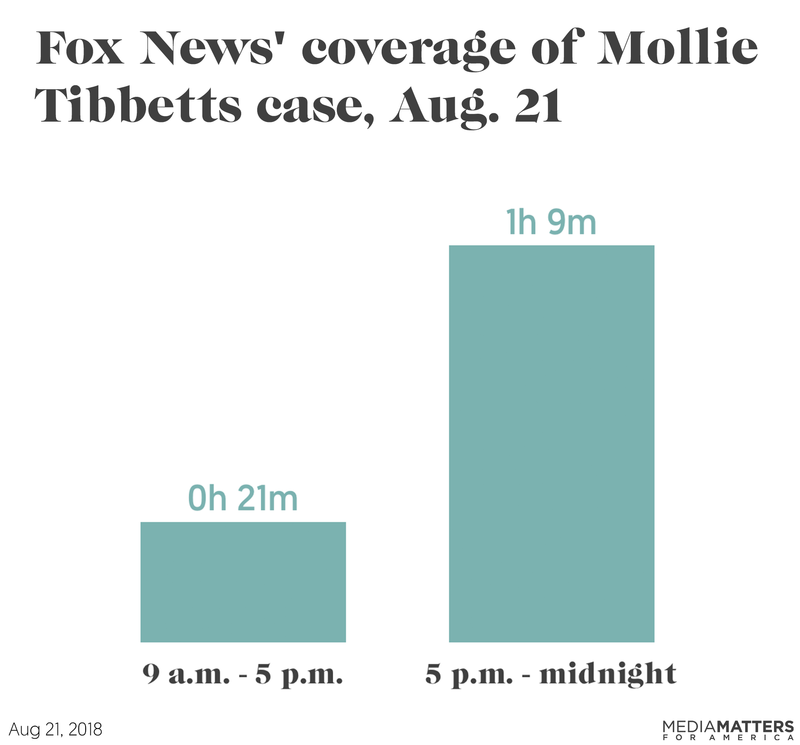 Fox News’ August 21 coverage of the tragic death of Mollie Tibbetts spiked after law enforcement identified their suspect as an undocumented immigrant. In the eight hours between reports that the 20-year-old University of Iowa student’s body had been found and the announcement of the suspect’s alleged legal status, the network discussed the story for 21 minutes; after law enforcement announced that the suspect was undocumented, that coverage spiked to over three times as much throughout the next seven hours. The news of Tibbett’s body being found broke around 9 a.m. that day, and Fox spent 21 minutes on the story during the next eight hours. But once local authorities identified the suspect as an undocumented immigrant during their 5 p.m. press conference, Fox’s coverage jumped to 69 minutes for the remainder of the evening. The spike in coverage occurred despite Fox airing President Donald Trump’s rally for over an hour and news breaking that former Trump campaign chair Paul Manafort had been found guilty on eight counts and former Trump personal lawyer Michael Cohen had pleaded guilty to two felony campaign finance charges in which he directly implicated the president. The story of Tibbetts’ death was featured on Fox’s entire evening schedule from 5 p.m. to midnight. Every single mention, tease, news correspondence, interview, and panel — save one, a less than 30-second comment on Tucker Carlson Tonight — noted the suspect’s alleged immigration status. Shortly after the press conference began, commentators on Fox were already weighing in on how Trump could use the revelation about the suspect’s legal status politically, while downplaying the developments in the Manafort and Cohen cases. One thing I think that the president might do is — maybe he won’t comment on either of these two things [Manafort and Cohen] at all given that we just heard from the police in Iowa with the Mollie Tibbetts case that they are holding — the federal government is holding a man, illegal immigrant, as a suspect in that case, in that murder. And to me — thinking about the fact that the Mueller thing is a little bit complicated; the Cohen thing is interesting, and it is explosive, no doubt. But if you are out there in America and you’re watching this and you’re thinking, “What do we really care about right now?” I think the president will probably be talking a lot about that. After the rally concluded, the remaining lineup on Fox all discussed Trump’s comments about the Tibbetts case and the suspect’s alleged immigration status. Tucker Carlson Tonight, Hannity, The Ingraham Angle, and Fox News at Night all included a clip of Trump’s speech at the start of segments about Tibbetts. The spike in Fox News’ coverage after local authorities linked Tibbetts’ murder to an allegedly undocumented immigrant made two things clear: The network was looking for a story to take some heat off the Cohen and Manafort news, and its streak of exploiting stories to hype “immigrant crime” remains unbroken. Media Matters searched the Snapstream video database’s transcript and closed-captioning archive on August 21 for variations (including misspellings) of the terms “Tibbetts,” “Mollie” within close proximity to “Tibbetts”, or “Tibbetts” within close proximity of “immigrant,” “killed,” “murder,” or “missing” on Fox News Channel from 5 a.m. to midnight. We timed all mentions, teases, news correspondence, interviews, and panels only for relevant speech about the Tibbetts case.